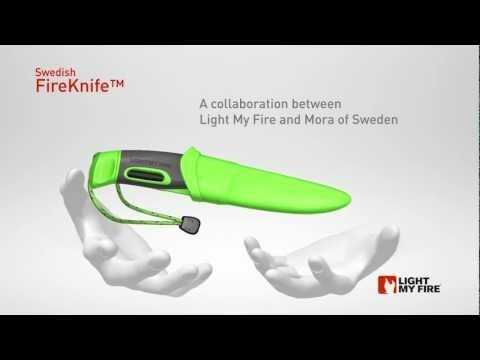 For camping or for emergency situations, the Swedish FireKnife combines a quality blade with a reliable fire steel in the handle. Build a fire, whittle your tinder, then strike the fire steel with the back of the blade. It works equally well for lighting stoves and barbecues. The cutting board helps protect the blade with cutting and gives you a clean work surface. High-friction rubber handle is comfortable to hold and secure to work with. Sheath has a clip to fit belts or straps. FireSteel is unaffected by cold, altitude, or water and produces a 2,980°C spark. Includes a small cutting board with a perforated edge that works as a strainer, and little book of Wild Cooking.